After reading Falling Into You, I became a Jasinda Wilder fangirl. Somehow she is able to write books that pull every emotion out of me. Wounded was no different. In fact the tone of this book was so intense that I felt it deep in my soul. This review may be a little scattered because I had so many feelings about this book but I’m not sure I know how to put it into words. 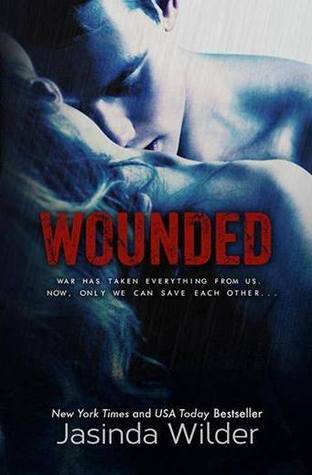 Wounded was so emotionally intense, it was almost depressing. However, when I say it was depressing , I mean it in a very good way. I’m know that doesn’t make sense and I’m not sure how to describe it but it’s the tone of the book and the way it makes me feel. It was so sad and heartbreaking but I absolutely adored it. Rania is probably the reason the tone of the book is so sad. She has lost everyone and everything and her country, Iraq, is rife with war and death and despair. At 14, she is forced to become someone she loathes and must do unspeakable things to survive. She creates Sabah, her alternate identity so she doesn’t lose herself in the job she must do to survive. Sabah is the whore who entertains clients and Iraqi soldiers for money. Rania is the innocent and reserved girl who has been alone for so long and never known love or compassion. My heart truly broke for her and her situation. When she meets Hunter, she has these unfamiliar feelings that she can’t explain and they terrify her. She has been empty for so long. Hunter is a soldier who is almost done with his second tour in Iraq but has no place and no one to go back to when he gets done. When he is injured in the line of fire, Rania rescues him and takes him back to her home. He quickly learns what Rania does but he never judges her. Hunter is this sweet and amazing guy. He sees Rania for who she is and not as Sabah. He never judges her and he feels this overwhelming desire to protect her. I loved the kindness and compassion that he showed her. The love that blossoms between Rania and Hunter was so beautiful. They are two people from two different worlds but they understood each other. They were both searching for something to fill the emptiness inside and little did they know that the something they were looking for was each other. Hunter saw the real Rania and the more time he spent with her the more he fell in love. He wanted to give her what she was missing and show her that she was worth more than she thought she was. Rania never thought she could find love or feel the way she did about Hunter. He opened her up and showed her that not all men want to just use her body. She was confused by the lust and hunger she saw in his eyes but his refusal to take her body. She had never known such restraint and kindness from a man. As she healed Hunter physically, she was unknowingly healing him emotionally too and he was doing the same for her. This book started out so sad and heartbreaking but ended on a very happy note. I went through so many emotions as I read this book. The writing was fabulous and the plot was like nothing I have read before. My husband is from Uzbekistan and we met in college when he was an exchange student so the “cultural clash” love really hit home for me. It is in no way the same situation but I understand the confusion that they felt as they fell in love. Hunter and Rania had been emotionally wounded when they met but they were able to save each other. Wow, I wasn't expecting that plotline but I'm intrigued. Will def be checking this one out. I love how different a setting this book has. Sounds emotionally intense. Oh wow, I definitely need to check this one out. How did I not even really hear about this before?? I love your review, I can tell it'll be another emotional one! Geez, I was almost in tears from reading your review. Anything that has to do with soldiers or Iraq is hard for me-- so that makes this one an "EH"-- though it sounds like a beautiful story. I loved Jasinda's Falling Into You and Falling Into Us and I've been wanting to read this one ever since! I hope I get to read it soon! Lovely review! I was definitely surprised by the plot line. I didn't really know what to think from the synopsis but it's Jasinda so I knew I would love it. It was definitely heartbreaking. Thank you! I felt the same way when I grabbed it. I was like "How have I not read this yet?" Thank you! I can understand that it would be tough for you to read books related to soldiers and war. Thank you! Falling into You and Falling into US are 2 of my favorite books. This is another amazing Jasinda Wilder read. I first read falling into you followed by wounded. This book was AMAZING! It has stayed with me and haunted me everyday since. This writer is so talented and amazing. There are really no words to describe her! I have since read the biker series, falling into us a d stripped (which came out yesterday). All are wonderful works of art! Agreed! Loved this book, it was so intense. Jasinda is totally amazing, I love all her work. I can't wait to read Biker Billionaire series.